After several years working at various companies, institutions and government bodies, I struck it on my own about 10 years ago. I ran my own boutique media and tech law firm (and later a boutique public relations firm briefly). Now I have a digital publishing company. Between then and now, I had always worked from a home office. Sometimes, I worked out of that space solely and other times, part time, splitting hours working in a shared-office suite I leased in the city. Naturally, to complete my office space, I had to get a mult-functioning printer that also had fax, copying and scanning capabilities. My first one was a very heavy bulky laser desktop version by Brother. It did the trick and lasted a long time. As my business grew and I started doing more public relations work for clients, I decided to get a supplemental printer. This second one was an even larger multi-function printer, made by Dell. It too was laser and could do print jobs super fast. It lasted several years and still works though it no longer faxes. Both came with printer cartridges that lasted pretty long before needing to be replaced. Recently, I upgraded the home office and acquired a few more desktops so the kids could each have their own computer. My eldest had several computer-based projects and my three school-aged kids were fighting too much over the two desktops we owned. I decided to leave the Dell to the kids and get myself a small desktop. So I set off one day specifically to search for a laser printing, assuming laser was mandatory for professional documents. 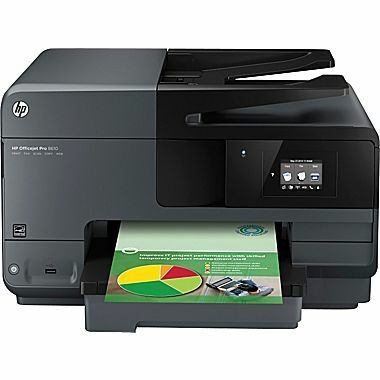 I headed to my local Staples store and saw an HP Office Jet Pro 8610 desktop printer there on sale for about $79.00 after a manufacturer discount. It was a good size to fit on my new desk or underneath it on the floor. It was color so I was geeked as I had never had a color printer before. I didn’t even realize that it was not a laser printer, though I should have known given the great price. It isn’t until I set it up that I realized. However, when I did my first few print jobs, I saw the quality was precise and distinctive. You couldn’t even tell it wasn’t a laser print job. I decided against returning it. I really dug being able to print in color as well. The color was sharp and true. It was great for flyers, and other graphic design projects. HP has a series of printables and templates you can access too that would supplement or complement your design needs. You could download a desktop app or use the ones offered through its Snapfish partner. 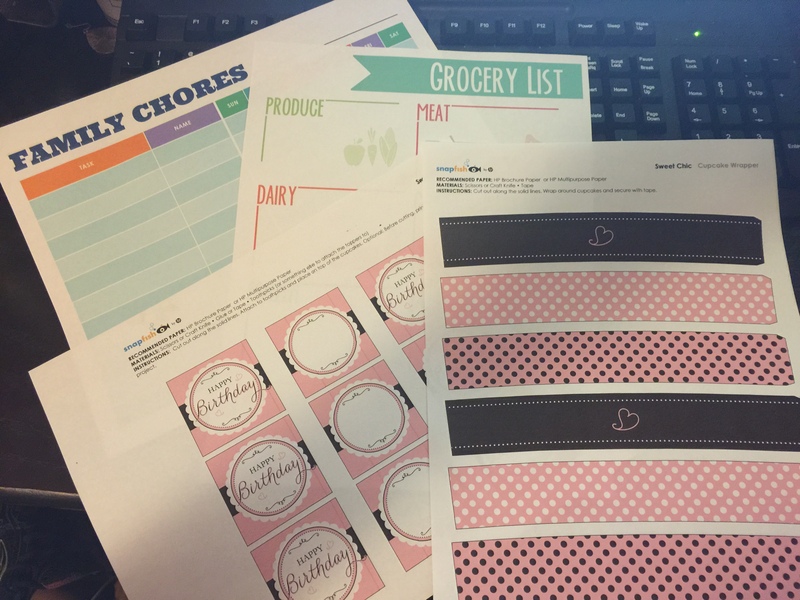 And the printables are not just for business documents, but also personal stuff like invitations, party printables, worksheets for the kids, greeting cards, family calendars, chore lists, grocery lists, meal planners, cupcake wrappers. The works! Because I have been so busy, I never took the time to study the owner’s manual and learn of all the other functions. Nonetheless, each month, I would discover a new one. Like, one time, my son started printing from his computer and that is when I discovered he had connected to the printer too via a wireless network connection option meaning, it could connect wirelessly to all the computers in the home and be used by each to print! One day, I needed to scan a document and that is when I learned that I wasn’t limited to the scanned document being simply downloaded as an electronic document on the c: drive in the attached computer. I also had the option to email the doc, send it to any of the other computers in the network, and to send it to a thumb drive I could connect to the printer. That last option could come in handy during rush time when you need to just pick up a doc and go! Then today, I finally had the need to send a fax and that is when I discovered that I didn’t need to connect the fax to the telephone jack in my wall via a telephone cord. It sent the fax via the IP network. (and it could send using the DSL, and other fiber optic non traditional landline telephone connections in the home). That was a great discovery for several reasons: 1.The wall jack was remotely located behind a bookshelf in my office and is very hard to access; and 2. I don’t even own a telephone cord long enough to reach. I feared having to haul the entire printer to the next room to connect to the jack there because it was more accessible physically there, not blocked by anything like a massive bookshelf. Thus, I was pleasantly surprised to see the fax was sent off in no time and I was given a fax confirmation promptly after to alert me it was successful. I got a call shortly after from the recipient to let me know the transmission was received. Perfect! It was a God-send because the other alternative would have been to feed and scan in several pages of documents, then take a few extra steps to forward the document off. It would have been a slightly more time-consuming process. I appreciated the quicker fax option. To think, so many young people these days don’t use and don’t really even remember the fax days. I even learned that you can print to home from anywhere in the world and even when you are far away from the printer. I imagine that this would be awesome if you had this printer at a remote location for an event, conference or convention you were running, for example. You could have some secretary, clerk or assistant back in the home office send in print jobs for event registration lists, guest updates, or Powerpoint presentations that someone forgot in the office. It prints photos if you feed photo paper and it has a borderless option so the photos print like photos you get from the drug store or print shop without the trim. You can print and fax at the same time. I discovered this on accident when my son sent something to print while the fax was sending a file. It can hold up to 240 pages in the printer tray and prints as fast as 13 seconds per page and up to 19 pages per minute. It has 2-sided printing for graphic jobs like printing brochures, menus and programs. It has an automatic document feeder so you can scan multiple documents without having to lift the flat bed and insert each one separately which could take a lot of time for large scan jobs. You can print from your desktop, tablet or phone, any device that connects to the printer wirelessly. It has the standard one-year limited hardware warranty. Overall, this is an awesome, highly recommended printer! You can order it from Staples and they will ship it to you for free. Or if you have Amazon Prime, get it there too and get it shipped for free! If you pick one up, do let me know how it works out for you!